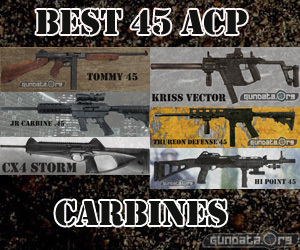 This article proudly details the best .45 ACP carbines on the market. The .45 is a killer cartridge and to some a bit of a handful in a pistol. Put this man-stopper in a carbine rifle and you have a match made in heaven! If you are looking for the ideal handgun or rifle for home defense, you are assured of excellent protection with a .45 ACP carbine. These powerful cartridges are brilliant because all you need is one carefully aimed shot, and you can easily defend yourself from any attacker or intruder. As stated before the carbines are larger and longer than their pistol counterparts. The extra barrel length actually ramps up the bullets velocity and in term it's energy. The heavier platform also makes the often punishing .45 acp more easily managed. These are not the best guns to conceal or carry around with you, but they are ideal for guarding your home and can be kept in large drawers, or violin / racket cases. This customizable gun allows you to select your preferred buttstock and barrel lengths. It has a glock magazine compatibility, and you can choose from the two standard barrel lengths that are either 16.5" or 19". When you get your base model, you will also receive a round hand guard and then you can choose from a fixed skeleton, M4 telescoping or Pinned M4 Target Crown Barrels. It retails at approximately $960. Shown above with optional vertical foregrip. This is an excellent option if the price is of concern. It retails at around $285 and features added barrel length. It specifications include a 16.5" barrel, a 31" length, and it weighs 6.25 lbs. It is ideal as a home defense choice, and it will handle the 45 better than most 12 ga shotguns handle even low brass bird shot. The Hi Point gets alot of hate from gun snobs, but this gun while ugly and looking like a weapon from planet of the apes, is reliable if fed the correct ammo. This much loved carbine has the ability to switch controls and the ejection direction from right to left, making it easy to use whether you are right or left handed. This gun can extend the practical range of the pistol cartridge out to 125-150 yards. It has a threaded muzzle that is useful for mounting a sound suppressor. This gun uses glock or 1911 magazines. It is priced between $500-700 on the open market. A pistol-calibre carbine, this Beretta is meant to provide the shooter with the familiar feel of the controls of a Beretta handgun. It accepts full size Beretta PX4 or 90 series magazines. Featuring a reversible operating handle and magazine release, it allows you to shoot or eject cases from right to left or vice versa. It is also easy to accessorize as it has a full length aluminium top rail, where you can mount optical and red dot sights. It is available from $880. Kriss Vector .45 ACP or Simply "The Kriss"
The Kriss Vector .45 ACP is a game changing platform that channels recoil back and down and not simply back. The end result is much closer groupings of automatic fire burst. This carbine has the ability to more easily keep the sights on the target after pulling the trigger. While a little strange looking at first once you get used to this compact little 45 carbine you will never want to go back to anything else. The Kriss is a game changing idea that will surely be a revolutionary step in gun design. Thompson Semi-Automatic Carbine Model of 1927 A1 "The Tommy Gun"
Saving the very best for last, this "tommy gun" is a .45 ACP carbine that has been made in the original Thompson design that was famous in the 1920's with gangsters. It features a 16.5" barrel (10.5" available with paperwork) and weighs around 12.3 lbs. The stock is made of American walnut, while the frame and receiver are machined from solid steel. If you are searching for a .45 ACP carbine, this list should give you a good idea where you start looking, and help you prioritise on the features that are important to you. Please be sure to like if you did, and share with your friends. Thanks for reading!